Can a Gulf War veteran suffering PTSD finally leave behind his past to find the music that will make his life worth living? Reagan returns from the first Gulf War haunted by horrific images of Tom Wallach, a dead marine he brought back from the desert. Seeking refuge from his nightmares and broken marriage in a jazz quartet in which he plays bass guitar, fifteen years elapse and he has a one-night fling with Rosary, a beautiful young woman he meets at one of his gigs. When his ex-wife comes back into his life, Rosary’s obsession turns into a fatal attraction. With help from Wallach’s ghost, the daughter Wallach never met, and a friend who is much more than he appears to be, Reagan discovers he must let go of his tortured past if he is to embrace the future. Reagan’s eyes fluttered open; he felt as if he were being watched. He glanced at the window: it was still dark. Sarah was breathing softly beside him. She was still asleep. His eyes moved about the room – there, on the corner chair, sat Tom Wallach. “You’re a light sleeper,” Wallach said. “I’m still a marine.” Reagan sat up. Wallach watched Sarah roll over; then he stood, motioned Reagan to follow him, and made his way to the door. Reagan rolled out of bed and stepped toward Wallach; halfway across the room, Sarah muttered, “Don’t leave me.” Reagan turned toward the bed, but Wallach spoke first. Reagan followed Wallach to the living room, where they sat, facing each other, in two high-backed chairs. “How do I know I’m not the one dreaming?” Reagan whispered. Reagan refrained from doing just that; at some level he knew this was real: across from him sat the ghost of Tom Wallach. “Death is permanent,” Wallach said. “I know,” Reagan said, looking away in shame. For the first time since he’d begun haunting Reagan’s dreams, Wal­lach looked uncertain, as if he didn’t know how much he could, or should, share with the living. Reagan could only hide his shame behind both hands. “I was angry,” Reagan said. “I already understand,” Reagan said. “This isn’t about us – you and me – and our past,” Reagan said. “Who are you talking to?” Sarah said from the entrance to the living room, and Wallach was gone, as if he’d never been there. 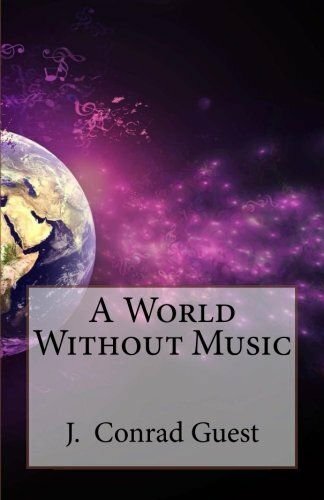 The Unsettling Beauty of a Perfect Chord… “Discussions of life, love, faith and the universe fuel J. Conrad Guest’s intriguing dialog-based novel A World Without Music. Music itself ‘stands half way between thought and phenomenon,’ a fascinating concept that leaves the reader pondering all. But the conversation’s powerful and real, and the tale moves on; locations change, topics flow and grow, and the reader soon feels like a traveler delighting in overhearing strangers who might become friends. “This novel’s path through music, movies, sci-fi, baseball, politics, faith and romance is endlessly intriguing and deeply involving, even as mystery deepens and danger looms. Allusions to jazz and song lyrics are as natural as the flight of a softball into the air, smoothly delighting the reader whether they’re caught or simply catch the eye. And Reagan, born to lust, love or jazz, has choices to make, and scary consequences to navigate.